Hertwig & Company produced porcelain dolls and figurines at their factory in the Thuringia area of Germany from about 1864 to 1941. Hertwig purchased the Marienfeld Porzellanfabrik in 1903. Hertwig is best known for their all bisque Snow Babies and Nanking Dolls with bisque heads and limbs and cotton (nanking) cloth stuffed bodies. Also, exclusive to the American market were the Pet Name China head dolls made by Hertwig. 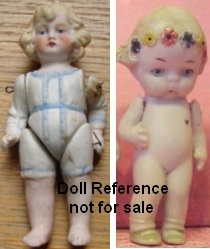 Other antique Hertwig dolls can be; All bisque dolls, Animals; Bears, Monkey, Rabbits and more, Bathing Beauties, Character dolls, Doll house dolls, Kewpies, Nodders, Pet Name China head dolls, Piano Babies, 1901 Snow Babies, bisque shoulder head dolls with molded bonnets; Margueritas, Half Bisque dolls and other figurines. Hertwig all bisque animals figures; shown on left; all bisque Hertwig Monkey and on right; all bisque Hertwig Rabbit, each about 2" tall. All Bisque, Dolls with molded clothing, Boys or Girls, various small sizes, jointed at shoulders and sometimes hips, painted hair and facial features, molded painted detailed clothing, doll marked: Germany or unmarked. All Bisque, Girl with Flowers in her hair, small sizes vary, jointed only at the shoulders, painted facial features, painted hair and flower head band, no clothing other than her painted molded shoes and socks, doll mark Germany or unmarked. Child Shoulder Head, 8 - 12" tall, bisque shoulder head with cloth body, bisque limbs, molded hair, closed mouth. 1895+ Pet Name China Head Doll, various sizes, made only for the American market, bisque shoulder head, cloth body, bisque lower limbs, molded painted hair & facial features, painted boots. Could also have been made by Closter Veilsdorf. Dolls are marked with their name printed in gold on front, names are: Agnes, Bertha, Daisy, Dorothy, Edith, Ethel, Florence, Helen, Mabel, Marion, Pauline and Ruth. Doll mark on back Patent Appd For Germany. Nanking Doll, various sizes, bisque head and limbs with cotton (nanking) cloth stuffed body, molded painted hair, doll mark Germany or unmarked. Shown on right; Pet Name, Dorothy China shoulder head doll with nanking (cotton) cloth alphabet printed body, China lower arms and lower legs with tiny boots. Doll marked as noted above. 1905-1907+ Butler Brothers advertised that they owned the molds to make the Our Pet named China heads and complete dolls on ABC alphabet cloth bodies, dolls are marked Patent Appd for Germany. with their name of front. Note: Closter (Kloster) Veilsdorf Porzellanfabrik also made the Pet Name China heads for Butler, although, it's unknown exactly which name molds were made by them. In 1929 Hertwig registered Biscoloid as a trademark.